2Centre for Health Research, Queensland University of Technology. Brisbane, Australia. The assessment of energy requirements is necessary for the development of individualised nutrition support regimens and recommendations. Measurement of energy expenditure is the most accurate method for determining energy requirements [1, 2, 3]. In the clinical setting, however, measurement of energy expenditure is impractical, timeconsuming and expensive. As such, prediction equations using easily measurable variables are commonly used to predict the basal metabolic rate (BMR) or resting energy expenditure (REE), which account for approximately 60-80% of total energy expenditure [4, 5, 6]. The development of cachexia is common in people with solid tumours such as pancreatic, lung, gastric and colorectal cancer. Cancer cachexia is associated with metabolic alterations that are likely to affect energy expenditure [7, 8, 9]. Patients with cancer cachexia are often malnourished; therefore, the provision of adequate nutrition support is essential for maintaining or improving nutritional status. Underfeeding and possible further weight loss in malnourished patients can result in an increase in complications and increased length of stay . Overfeeding is also associated with complications such as hyperglycaemia, hyperlipidemia, hepatic dysfunction and respiratory distress . Studies comparing mean measured REE and predicted REE by Harris-Benedict equations  in patients with pancreatic cancer have shown inconsistent results [13, 14, 15]. These studies have all compared, measured and predicted REE at the group level, whereas individual predictive accuracy is important in the clinical setting. The method described by Bland and Altman is the appropriate statistical analysis for assessing agreement between two measurement methods . Although no prediction equations have specifically been developed for people with cancer, a number have been developed in healthy populations. Comparison of measured REE with estimates of REE using these prediction equations would determine whether they are appropriate for use in people with cancer, whether alone or in combination with a constant stress factor. The combination of an injury factor of 1.3 with the Harris- Benedict equations is commonly recommended for patients with cancer [17, 18, 19]. Only the Harris-Benedict equations have previously been compared to measurements of REE in cancer patients. The aim of this study was to compare predicted REE from a number of published prediction equations to the measured REE of a sample of patients with pancreatic cancer. 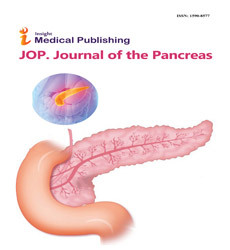 Eight patients (5 males, 3 females; age 62.0±5.2 years; body mass index 24.4±3.2 kg/m2; weight loss in past six months 12.1±6.0%; mean±SD) with pancreatic cancer receiving palliative treatment who had lost greater than 5% body weight in the previous six months had their resting energy expenditure measured. Diagnosis was based on histological and/or radiological (computerized axial tomography) or operative diagnosis. The disease was staged according to "Union Internationale Contre le Cancre (UICC)" criteria (stage II: local spread, 3 patients; stage IV: distant metastases, 5 patients). Four patients participated as part of a nutrition intervention trial and had more than one consecutive measurement at least 4 weeks apart. A total of 15 resting energy expenditure measurements were performed. Characteristics of patients who participated in the study are shown in Table 1. Resting energy expenditure was measured by open circuit indirect calorimetry (Vmax 229, Sensormedics, Yorba Linda, CA, USA) using a mouthpiece and noseclip in a thermoneutral environment. Patients had fasted overnight (12 hours) and rested for 30 minutes prior to the measurement. Measurements were taken between 7:00 and 9:00 am. Gas analysers were calibrated prior to each measurement against standard mixed reference gases. The mass flow sensor was also calibrated prior to each measurement. Measurements were carried out for at least 30 minutes. The steady state period was determined by the computer software and was defined as a 5-minute period during which average minute oxygen consumption (VO2) changed by less than 10% and the respiratory quotient (RQ) changed by less than 5%. REE was determined from VO2 and VCO2 using the abbreviated Weir equation . Weight was measured to the nearest 0.1 kg (Tanita Inc., Tokyo, Japan, Model 300GS) and height measured to the nearest 0.1 cm with a stadiometer (Harpenden, Holtain Ltd, Crosswell, Dyfed, UK). Total body water was measured using the stable isotope deuterium in the form of water (2H2O). Patients provided a urine sample and then drank a 10% solution of 2H2O based on their body weight (0.5 g/kg body weight). The amount of deuterium consumed was weighed to 2 decimal places. A second urine sample was provided 5 h later. The enrichment of the pre-dose urine sample, post-dose urine sample, local tap water and the dose given were measured using isotope radio mass spectrometry (Hydra, Europa Scientific, Crewe, UK). The deuterium oxide dilution space was divided by a factor of 1.04 to calculate total body water . Fat free mass (FFM) was estimated from total body water assuming a constant hydration factor of 0.73. Four prediction equations using a combination of easily measurable variables (weight, height, age) and two prediction equations based on a measure of FFM were examined (Table 2). The ratio method commonly recommended by nutrition societies and clinical nutrition textbooks [22, 23, 24] was also included in the analysis. Although a value of 30-35 kcal/kg is commonly recommended for cancer patients to predict total energy expenditure, for the purpose of this study, a value of 20 kcal/kg was used as the estimate was compared to resting energy expenditure. The equations by Ireton-Jones et al. were not included in these analyses as they predict total daily energy expenditure and are therefore not comparable to measured resting energy expenditure. The units of energy calculated from the equations varied. All predicted REE values were calculated as per equation then converted to kilojoules. The Ethics Committee of the hospital approved the study and informed written consent was obtained from all participants. Statistical analysis was carried out using SPSS for Windows (Version 11.0.1, 2001, SPSS Inc., Chicago, USA). Mean, standard deviation (SD), and frequencies were the descriptive statistics used to present patient characteristics. The paired Student's t-test was used to assess individual differences between measured REE and predicted REE by each equation. The approach of Bland and Altman was used to compare the agreement between measured REE and REE estimated from the prediction equations . This analysis allowed for the calculation of bias (mean of the individual differences between estimates) and the limits of agreement (±2 SD from the mean bias). Correlation analysis was used to examine the association between the mean of the measured and predicted REE, and the differences between the two methods. Statistical significance was reported at the conventional P<0.05 level (two-tailed). The interpretation of the differences was not based solely on statistical testing but also on clinically important differences in energy expenditure which was defined a priori to be greater than 400 kJ/day (equivalent to greater than ±3-6%) for this sample of patients . Mean measured REE was 6,557±1,131 kJ/day (1,568±270 kcal/day) or 123.0±14.5 kJ/kg FFM (29.4±3.5 kcal/kg FFM). Table 3 shows mean predicted REE, the bias (mean difference between predicted REE and measured REE) and limits of agreement (±2 standard deviations of the bias) for the prediction of REE for each equation relative to the measured REE. There was no significant difference between mean measured and predicted REE from the Harris- Benedict (no injury factor), Schofield, Owen, Mifflin, Cunningham, and Wang equations and the 20 kcal/kg ratio method. The Harris- Benedict equations with an injury factor of 1.3 resulted in a significantly higher (P<0.001) mean predicted REE as compared to measured REE. There was a significant correlation between measured REE and REE as predicted by Harris-Benedict equations alone, Harris- Benedict equations with an injury factor of 1.3, Schofield equations, Owen equations, Mifflin equations, Cunningham equation, Wang equation and 20 kcal/kg ratio method; however, this is a measure of the strength of the relationship - and not a measure of the level of agreement - between the two methods . The smallest bias was observed with the Wang equation (15 kJ) followed by the Harris-Benedict equations alone (22 kJ) and Owen equations (60 kJ). The 20 kcal/kg ratio method, Mifflin and Cunningham equations tended to underestimate REE values, while the Schofield equations and Harris-Benedict equations with an injury factor of 1.3 tended to overestimate REE values. The bias for all prediction methods was consistent across the range of measurements of REE as the mean of the measured REE, and predicted REE was not significantly correlated with the difference between measured and predicted REE for all prediction equations. Individual data indicates that the limits of agreement for each of the prediction equations are wide, with the narrowest limit evident with the Cunningham and Wang equations (1,280 kJ for both) and the widest limits with the Schofield equations (2,134 kJ) and Harris-Benedict equations with an injury factor of 1.3 (2,105 kJ). Nine (60%) measurements of REE were within ±10% of REE predicted by the Harris-Benedict equations, three measurements (20%) were classified as hypermetabolic (REE greater than 110% of the Harris- Benedict-predicted value) and three measurements (20%) were classified as hypometabolic (REE less than 90% of the Harris-Benedict-predicted value). The aim of this study was to compare the agreement between predicted REE from a number of published equations to measured REE in patients with pancreatic cancer. For good agreement, it is expected that bias will be close to zero, that 95% of the differences will lie between the limits of agreement and that there is no clear evidence of a relationship between difference and mean of measured and predicted REE. Based on these assumptions, mean predicted REE from the equations developed by Harris-Benedict, Schofield, Owen, Mifflin, Wang, Cunningham and the 20 kcal/kg ratio method agree with mean measured REE at a group level. The Harris-Benedict equation with an injury factor of 1.3 for cancer is not suitable at the group level due to the large overestimation. To consider how well the methods are likely to agree for an individual, the limits of agreement are assessed and, provided they are not clinically important, the methods can be used interchangeably. In this study the limits of agreement are wide (greater than 400 kJ) for all equations. For an individual with cancer cachexia, predicted REE from commonly used prediction equations cannot be used interchangeably with measured REE, as there would be clinically important differences in the REE results obtained. As an example, the Wang et al. equations may predict REE as much as 1,295 kJ above or 1,265 kJ less than measured REE for an individual, while the Harris-Benedict equations with an injury factor of 1.3 may predict REE as much as 4,100 kJ above or 110 kJ less than measured REE. Reeves and Capra , in their survey of more than 300 clinical dietitians in Australia, determined that 67.4% of respondents used the Schofield equations and 25.9% used the Harris-Benedict equations for prediction of energy requirements for a cancer case study. The majority added an injury factor for cancer to their estimate (median injury factor of 1.3) . In the present study, the addition of the injury factor of 1.3 recommended for cancer to the Harris-Benedict equations significantly overestimated energy requirement. The use of injury factors has recently been questioned by Reeves and Capra . This study indicates that the automatic application of an injury factor for patients with pancreatic cancer is not appropriate, as only 20% of measurements were greater than 110% of predicted REE from the Harris-Benedict equations. Such gross overestimation of energy requirements could lead to negative complications associated with overfeeding . A wide range of metabolism from hypometabolic to hypermetabolic has been observed in cancer patients [14, 28, 29, 30]. The metabolic response to cancer is highly variable as even within the same type of cancer, REE is increased in some patients and not in others . Dempsey et al. found that patients with pancreatic cancer were predominantly hypometabolic whereas Falconer et al. and Barber et al. found elevated REE in patients with pancreatic cancer. In this study, the mean REE predicted from Harris-Benedict was 100.8±14.1% although 20% of measurements were classified as hypometabolic and 20% hypermetabolic. Several investigators have shown that the Harris-Benedict equations overestimate energy expenditure in the healthy population by 5-15% [32, 33, 34, 35, 36, 37]. Therefore, the number of patients with true elevated REE may be underestimated. In clinical practice, measurement of energy expenditure is impractical, time-consuming and expensive. In spite of the limitations of prediction equations for use in individuals, clinicians require an estimate of REE. In this study the best combination of low bias and narrow limits of agreement was observed in the prediction of REE from the Wang equation based on FFM. Measurement of FFM using the deuterium dilution technique is impractical in the clinical setting, and other methods such as bioelectrical impedance analysis have been shown to be inaccurate at prediction of FFM at the individual level in patients with cancer . Therefore, most clinicians rely on REE prediction equations that incorporate easily measurable variables, such as body weight and height. Of these, the Harris-Benedict equations gave the lowest bias and narrowest limits of agreement, followed by the Owen equations. Therefore if both weight and height were available, the Harris-Benedict equations would be recommended and if only weight is available, the Owen equations. As the limits of agreement for both equations are wide, clinicians should be aware of the limitations of the equations for individuals and that monitoring of patient outcomes is essential. A limitation of this study was that more than one REE measurement was performed on four of the study patients who were participating in a nutrition intervention trial. As the aim of the study was to compare agreement between REE methods, repeated measurements have been included in the analyses as there were significant changes in weight and body composition between repeated measurements for all four patients. Hence changes in measured REE due to changes in body composition should also be reflected in predictions of REE. An additional limitation relates to the assumption that the hydration of lean tissue is constant at 73%. In pancreatic cancer, development of oedema or ascites is a feature of the end stage of the disease. Changes in fluid distribution such as oedema or ascites may lead to inaccurate body composition determinations . Although no patients with visible oedema or ascites were included in the study, it is possible that some patients had subclinical fluid retention. Finally, the variation in the level of metabolism observed might be due to differences in disease stage or other factors associated with the disease. The sample size in this study was too small to investigate this further. From a clinical practice perspective however, this study has been informative in identifying the potential for gross overestimation of REE with the automatic application of injury factors with prediction equations. 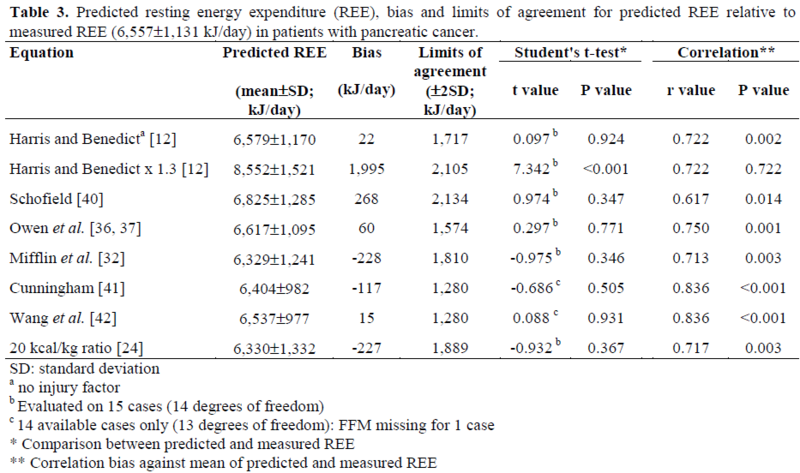 At a group level, the equations developed by Harris-Benedict, Schofield, Owen, Mifflin, Wang, Cunningham and the 20 kcal/kg ratio method are suitable for predicting the REE of pancreatic cancer patients. However, these results suggest that for an individual, the limits of agreement are wide for all prediction equations and clinically important differences in REE would be obtained. Clinicians need to be aware of the limitations of the use of REE prediction equations for estimating individual REE in pancreatic cancer patients. Monitoring of patient outcomes is the most effective method of determining whether patients are receiving adequate nutrition support. Harris JA, Benedict FG. A Biometric Study of Basal Metabolism in Man. Washington, DC, USA: Carnegie Institution of Washington, 1919. Lysen LK. Quick Reference to Clinical Dietetics. Gaithersburg, MD, USA: Aspen Publishers Inc., 1997. Alpers D, Stenson W, Bier D. Manual of Nutritional Therapeutics. 4th edition. Philadelphia, PA, USA: Lippincott Williams & Wilkins, 2002. Dietitians' Pocket Book. Perth, Australia: School of Public Health, Curtin University of Technology, 1999. Weir JB. New methods for calculating metabolic rate with special reference to protein metabolism. J Physiol 1949; 109:1-9. Bloch AS. Cancer. In: Matarese LE, Gottschlich MM, eds. Contemporary Nutrition Support Practice: A Clinical Guide. Philadelphia, PA, USA: W.B.Saunders Company, 1998. Bloch AS. Oncology. In: Lysen LK, ed. Quick Reference to Clinical Dietetics. Gaithersburg, MD, USA: Aspen Publishers Inc., 1997.